With this mod you can make a real battle Pokémon. This mod will add more than 80 different Pokemon. Each of these Pokémon will have their own unique abilities and attacks. All Pokemon will spawn in the game quite differently. Some will appear only in the afternoon, and some only at night. Catch any pokemon you can with a special ball for catching Pokemon. You will be able to treat their Pokémon and raise their level, then they will become more stronger. 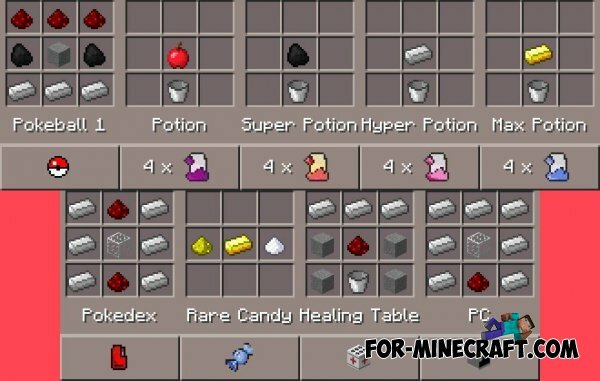 Extreme Herobrine mod 2 for Minecraft PE 0.10.4With this new mod you would expect even more difficult battle with herobrin. Now he has become much stronger and it will be very difficult to win. Pokemon Mod for Minecraft PE 0.9.5Hello! This mod adds to your world ever Pokemon cartoon! All of these Pokémon will have unique abilities. Ello. I was wandering how to download the mod... I don't like pokemon but pokemon on MCPE I would LOVE!!!!!!! Thanks plzz reply in email or here.